Check out today's pricing and retail availability for bargain Cotes de Roussillon. 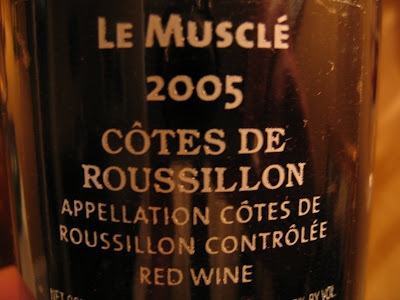 Original Review, three years from vintage date, April, 2008: The French red Le Muscle Cotes De Roussillon 2005 shows a deep ruby red in the glass. It is finished at a generous 14.5% alcohol. On the nose, you detect a powerful perfume of concentrated violets and plums. On the palate, the intensity continues... concentrated blobs of inky red fruit pummel the cavities of your mouth, searing it with bold red fruits. A lasting finish, wrapping tannins in profound brightness. Three stars out of five, with plus for power. Gary Vaynerchuck liked it even better, awarding 91 points. Updated Review, seven years later, now 10 years from vintage date, July, 2015: Deep mahogany red, opaque from a half inch of the edge. Nose still carries bright and bold violets and lavender, full of background oak too. 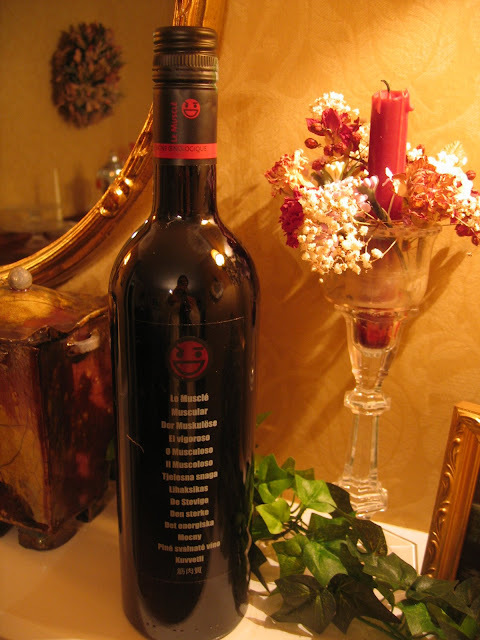 On the palate, still gobs of big, lean and - yes - muscular, ripe red fruits. Layers of lavender that pulls around the fat middle. Bright acids and tannins stretch the sip on and on. The finish grinds to a very slow halt with the grainy fruit spitting out sweet blackberry, cocoa and purple flowers for a very, very long time. Now moves to an easy four stars on the Spirit of Wine scale, with a plus for potency and layers, and is a definite best value at a full decade of age. The sad part is the label is no longer available, even in newer vintages. (c) Copyright 2008, 2015 Spirit of Wine, all rights reserved. If you are a winery, distributor or marketing agent and you would like to see your (or your client's) wine featured at Spirit of Wine, here are two options: 1) Wait, pray and hope - we may find you someday; 2) Submit a wine for review. No charge. Particulars are here. If you are reading this full posting on any site other than Spirit of Wine, chances are it is a copyright violation.